Scott Murphy has won Columbia County handily. The totals are 8,449 to 6,560. Scott Murphy knows how important Columbia County is to his victory and is proving it by putting 10 campaign workers into the county and by having three major campaign appearances in Hudson in this final weekend of the campaign. Appearing with Scott Murphy will be with Representative Jim Clyburn, the third-ranking Democrat in the House of Representatives. Read all the details on the Hudson City Democrats website. WMHT and Times Union invited all three candidates for the 20th Congressional District seat to participate in a televised debate. Only one person didn't show up. See the entire debate here. SCOTT MURPHY FOR CONGRESS RALLY IN HUDSON! There will be a rally for the Scott Murphy for Congress campaign in Hudson on Saturday March 21st at 3pm in 7th Street Park. Accompanying Mr. Murphy will be Congressman Paul Tonko. 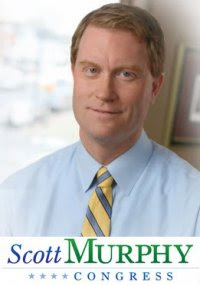 Please come out and welcome Scott Murphy to Hudson and Columbia County. Get all the latest campaign news here. See all of the campaign ads and other videos here. 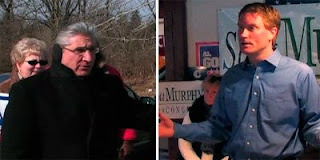 The Scott Murphy for Congress campaign has released a new ad on Jim Tedisco finally answering the question. 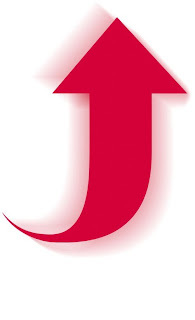 Would Jim Tedisco have voted for the Stimulus Bill which will bring tens of thousands of jobs to Upstate NY? Senator Gillibrand records ad for Scott Murphy. Republican Jim Tedisco continues to avoid the question whether he will support Obama's stimulus package. On Fred Dicker's WGDJ-AM radio show, 3.13.09. 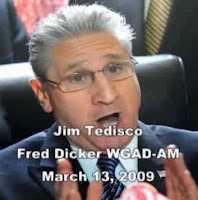 If you still think that Jim Tedisco is the right man for the job, you won't after listening to his own words. Columbia County Democrats Chair Chris Nolan attended the endorsement of Scott Murphy for Congress by Governor David Paterson, Senator Charles Schumer and Representative Charles Rangel. He shot these photos on his phone. 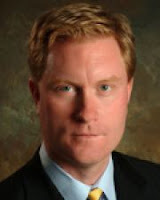 View all of the official campaign ads from the Scott Murphy for Congress Campaign here. The Democratic Congressional Campaign Committee has released an ad supporting Scott Murphy's candidacy for the 20th District seat formerly held by Senator Kirsten Gillibrand. Listen to the DCCC Radio Ad. It is time again for Columbia County Democrats and friends to come together and work as hard as we can to elect SCOTT MURPHY for CONGRESS for the seat vacated by now Senator Kirsten Gillibrand in the 20th Congressional District!! We all worked very hard for a very long time to turn this district blue- we cannot let it slip back into Republican hands!! 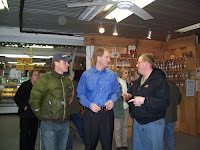 Many of you got to meet Scott for the first time during his swing through Columbia County last weekend. In the past few days he has secured the Independence Party and the Working Families Party lines and been endorsed by the AFL-CIO, NYSUT, PEF, CSEA, and many other unions. Senators Kirsten Gillibrand and Chuck Schumer have come out to campaign for him. The Republican National Committee and conservative PACs have made this race a national priority. They hope that Jim Tedisco, who does not even live in the district, can win back the district for the Republicans. They have invested hundreds of thousands of dollars in TV and radio ads to attack Murphy. If Tedisco is elected, he will use his platform to denounce the new administration and the Democratically controlled Congress just as he has done for years in New York. WE CANNOT LET TEDISCO WIN!! The Special Election will be held on March 31, less than four weeks from now. Increasing Murphy's name recognition and turnout is key to winning. WE NEED YOUR HELP!! This weekend the Scott Murphy for Congress campaign is planning canvassing in the Hudson area and phone banking at the headquarters in Ghent. Can you spend a little time this weekend to help keep Columbia County blue and elect Scott Murphy to Congress? If you would like to help, please contact the Murphy campaign Columbia County field coordinator, Jennifer Martin at jenyfer718@gmail.com. ccSCOOP asked both of the candidates for the 20th Congressional district the same five questions. They have presented the candidates’ responses to the questions in separate videos—one for each topic. 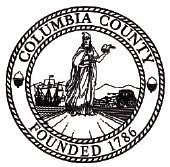 The Columbia County Board of Elections has issued a release on the upcoming special election to fill the seat vacated by Senator Kirsten Gillibrand. The board is clarifying issues with the new ballot marking devices and has issued instruction for requesting an absentee ballot. You can read the Board of Elections message by clicking here. CBS6Albany streamed the AARP debate on Tuesday March 3rd from 1:30 to 3:00 p.m. It will be re-streamed at 7 p.m. Thursday February 5th. To view the debate all you have to do is log on to cbs6albany.com at the designated start time and you'll find the video stream box right on the homepage! They will also be streaming the WROW debate 3/26 at 7 p.m.